UFC is coming to Xbox Live this December! Starting on December 1st, you'll be able to order live UFC pay-per-view events in 720p, access the UFC on-demand video content, connect with friends to predict fight results and see your results on the UFC leaderboards. 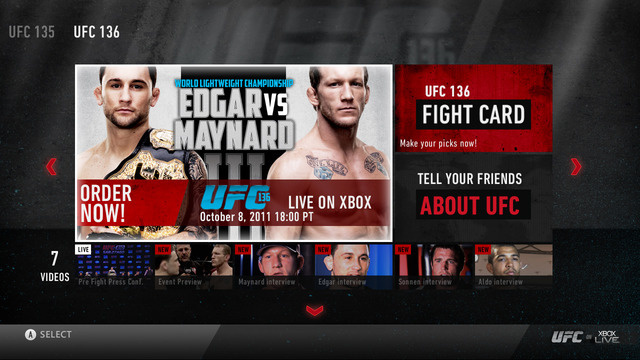 The first live pay-per-view fight and your chance to order from your Xbox will begin with UFC 140: Jones vs. Machida and Nogueira vs. Mir II. * Live and On-Demand Video– Event previews, UFC Countdown, press conferences, weigh-ins, interviews, workouts, highlights, and more, together for the first time on your big screen. * Streaming HD Quality in 720p – UFC fans demand stunning HD viewing, and Xbox LIVE brings the most premium streaming HD to the big screen. * Pay-Per-View with Ease – The biggest pay-per-view fights available to all Xbox LIVE members in HD and SD pricing options. Purchase directly with your credit card, Microsoft Points not required. * Interactive Fight Card with Predictions – Size up the fighters with the tale of the tape and view their past fight results. Predict upcoming fights, compare results with friends for points and bragging rights, and see where you stand against them on the leaderboard, all accessible while watching the fight so you’ll never have to leave the excitement of the Octagon. * Control the action with Kinect – Focus on the fight instead of looking for the remote. Navigate through the video content, bring up the Interactive Fight Card, or play, pause, and rewind that big punch, kick or submission…all with the magic of Kinect.